Earlier, I told you about Rachel Stafford’s first book Hands Free Mama: A Guide to Putting Down the Phone, Burning the To-Do List, and Letting Go of Perfection to Grasp What Really Matters . Her new book Hands Free Life: Nine Habits for Overcoming Distraction, Living Better, and Loving More is just as good. Our legacy for loved ones is built through tiny choices made over and over again, every day. “Through loving daily practices, we are able to create the kind of permanence that becomes the cornerstone of a life, a GPS for a world in which we are so easily lost,” Stafford shares. 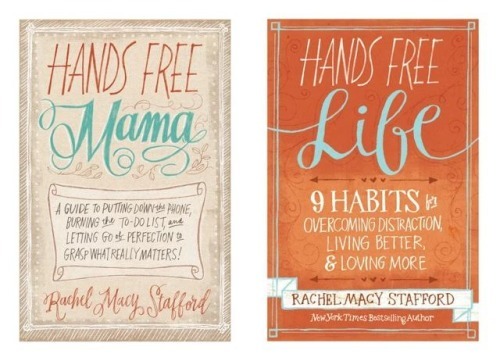 “Although I may fall short and make mistakes today, I can do one thing well: I can listen.” Stafford shows readers that by being fully present in a moment, both the listener and the speaker gain power, perspective, and life-affirming connection. –Transform from a negative person into a positive one. 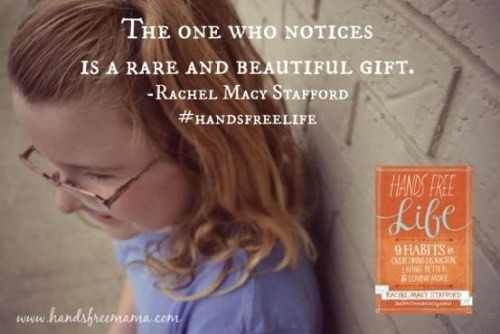 I don’t agree with everything Rachel Stafford writes, but I wish every young mother could read her discussion about that modern-day problem of needing to continually be connected to an electronic device. Let today be a day of encouragement and affirmation for all of us! This entry was posted on Wednesday, October 21st, 2015 at 1:49 pm	and is filed under Counseling, Marriage, Raising Children, Reviews. You can follow any responses to this entry through the RSS 2.0 feed. Both comments and pings are currently closed.